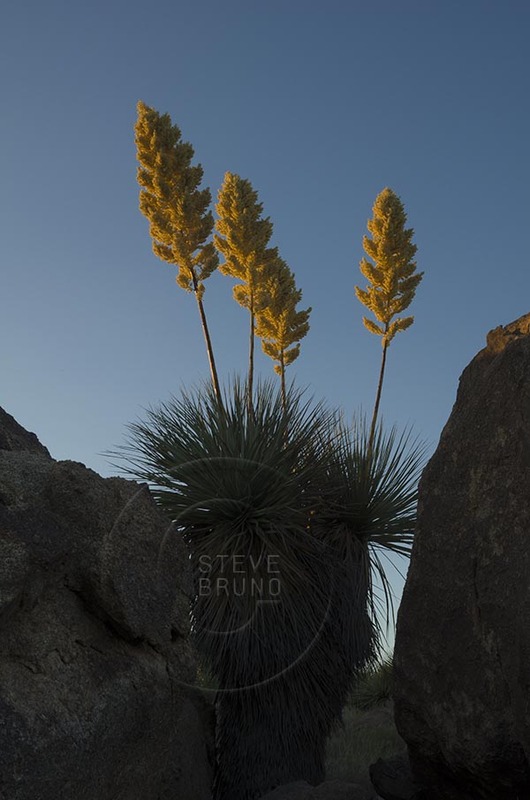 I was driving down to Phoenix Monday afternoon, and as the sun was about to set I noticed an area where the yucca blooms were still holding on. There was no fantastic lighting, but I got out to see if there were some photo opportunities nonetheless. The yuccas, which start to bloom around early June, produce stalks of white flowers, which eventually dry out to a golden color before finally blowing off when the summer storms come through. The ones that were left were in the golden stage, and stood out from the rest of the surroundings. 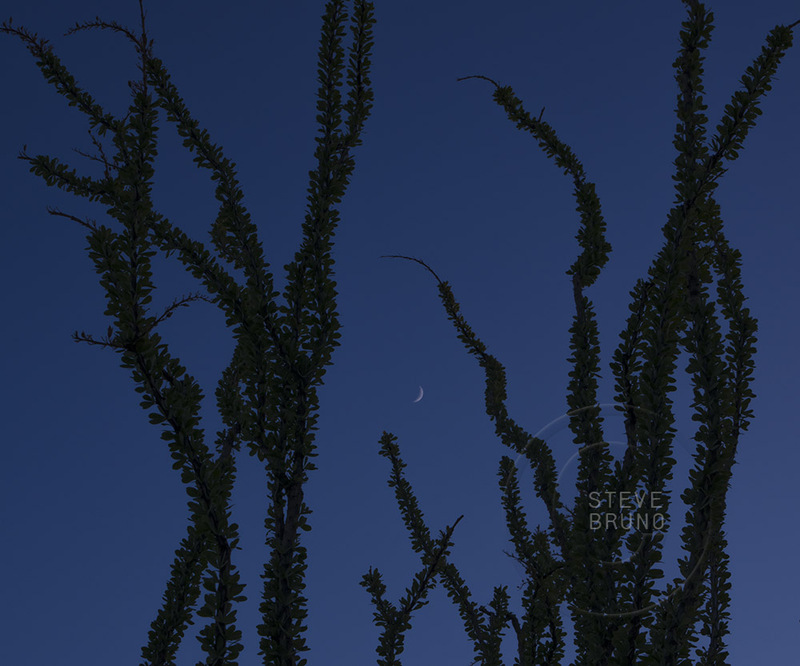 As I was meandering around, I stood next to this ocotillo plant with the moon hanging amidst its branches. I loved the way its textures stood out against the simple sky, with just a sliver of a moon for perspective. After this shot I was about to wrap it up, but the skies were becoming a luminescent backdrop for the yucca plants. I spotted a photogenic grouping of the plants, but then thought to myself this is stupid. I hadn’t brought along a flashlight or even my phone, and had ventured at least 10 minutes from my car. The route had some rocky terrain and potential snake habitat. 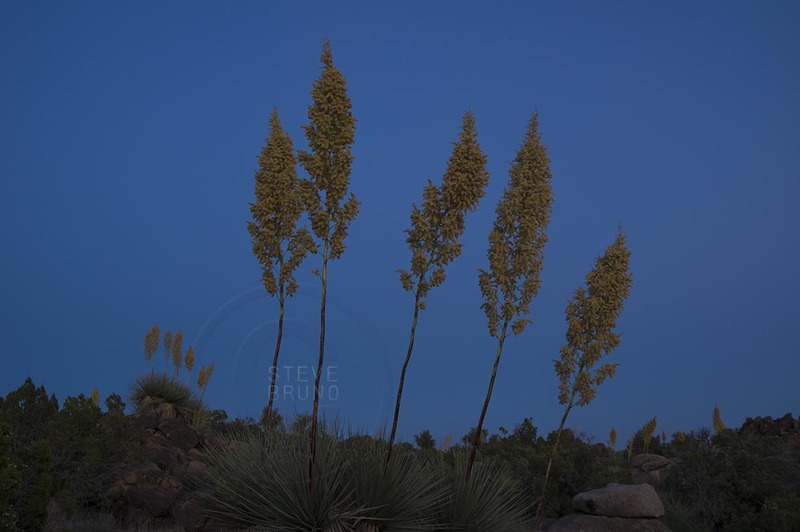 I looked up at my ocotillo moon and its angle in the sky and knew it would be sufficient to get me back, so I waited patiently for those moments when the subtle breeze faltered, allowing the yucca flowers to become still. These were worth the stop. I especially like how the yellow plays against the sky in the first shot. Thank you, Nadia. Normally plain blue skies don’t inspire me to bring out my camera, but it was appropriate here.